Last year we began raising pigs on pasture. We started with a small herd of eight Yorkshire/Duroc cross piglets. Then we added to the herd with eight Berkshire piglets. After that, we added a group of Ossabaws, which are an endangered breed of pig that produces a special dark, rich ham. 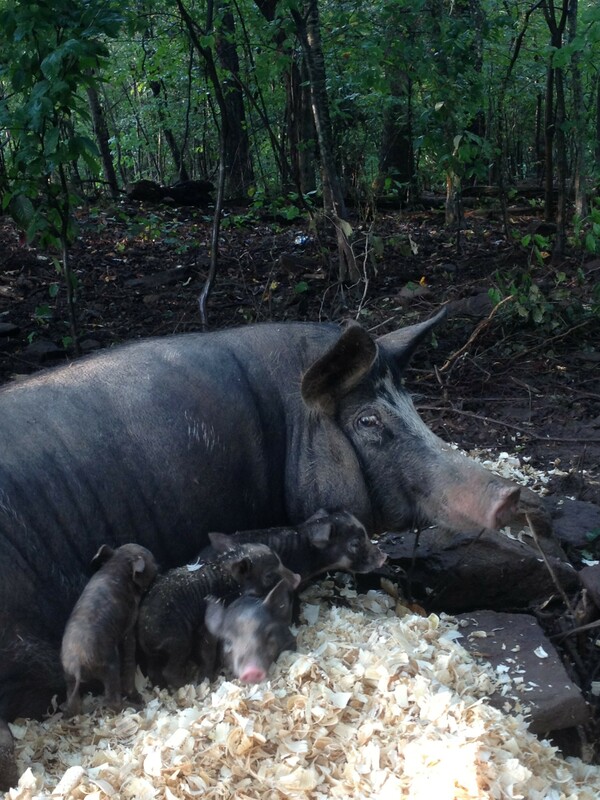 This is a picture of a mother Ossabaw with her piglets in our woods. We thought chickens were entertaining. Pigs make chickens look lazy. We have discovered that portable electric pig fencing is even easier to use and less expensive than the feather net that we use for the chickens. We have also learned that pigs will do your landscaping for you if you let them, and your goal is to have every scrap of your turf uprooted. Very useful for getting rid of nasty underbrush. We learned how to raise pigs at Joel Salatin’s Polyface Farm last summer, during his two-day “Discovery Intensive.” Joel raises his pigs in the woods on top of a mountain where they turn thick underbrush into lush savannah. Now we have lots of pigs and we are selling our delicious, pasture raised pork to a chef who runs a group of restaurants in Charlotte, and at the Huntersville Growers’ Market on Saturday mornings. Who knew pigs could be so productive? They really are wonderful, intelligent animals, and full of personality. Here’s a picture of Pumbaa (below), our very special pig that actually made it into the New York Times. I’ll post that story later. He represents the heart and soul of WhyNot Farm. Next PostNext We have a new baby!